Taking time off from his regular life in Toronto, Norbu Dhondup headed to southeast Asia on a spiritual journey. After completing his preparations, such as buying camping gear and the cheapest flight ticket, he landed in Malaysia. “Kuala Lumpur”, he says, “is a nice city. It feels even better than many Western cities.” As a Buddhist on his spiritual journey, he visited some Buddhist temples in and around the city. On the second leg of his journey, in Thailand, he explored more of the country and visited more Buddhist temples. He went to Koh Phangan, one of the many islands of Thailand, popularly renowned for its monthly Full Moon Party at Haad Rin beach, where revellers from around the world congregate for a boisterous night-long celebration. But the island is not only about the Full Moon Party. It also draws as many quiet holiday-makers as well as spiritual seekers, as the island hosts many new age centres offering yoga, meditation, “tantra”, detox, ecstatic dance, bhajan, ceremonies — and several traditional Theravada Buddhist monasteries and meditation centres. Thailand received about 35 million tourists in 2017, making an industry accounting for around 12 percent of the economy. Its islands are among Thailand’s most popular tourist destinations. Exploring Koh Phangan on his rented scooter, Dhondup has found that there are nine wats (a term borrowed from Sanskrit to mean “temple” in Thai). Wat Sri Thanu has already become his spot for morning meditation. He is planning to be on Koh Phangan for a month, which means a lot of meditation, coconuts, good food, music, and meeting people. In conversation during a sunset on the beach, Dhondup told us about his journey. He was born in Nepal 33 years ago. His parents had escaped into exile there after the Chinese occupation of Tibet in 1959. He grew up in Nepal among about 20,000 exile Tibetans, and attended a Tibetan school. He learned the usual subjects, including Tibetan language and Buddhist philosophy, but only went up to Class X. Soon after, he joined his family in Canada. There he attained a GED (General Equivalency Diploma, equivalent to Class XII graduation) to complete his schooling, but did not pursue further studies. He entered the job market, doing cleaning services for offices and houses. He has had a strong interest in Buddhism since childhood, and over the years has read many books on Buddhism in English. He eventually discovered and practised Vipassana meditation, particularly the Goenka tradition. He took his first 10-day Vipassana retreat about 10 years ago in Kathmandu. Since then he has done yearly retreats in different countries such as India, Canada, and the US. Explaining Vipassana, Dhondup says it is a meditation method that is part of all Buddhist traditions. Particularly in Theravada, meditation is begun right away in the practice of Buddhism. The Vipassana method of meditation spread to the West, and was further popularised by SN Goenka in the tradition of Sayagyi U Ba Khin. He says that the Theravada school of Buddhism believes that it has remained closest to the original teachings of the Buddha. I asked Dhondup why he was in Koh Phangan. He had heard about Koh Phangan in Goa in 2014. 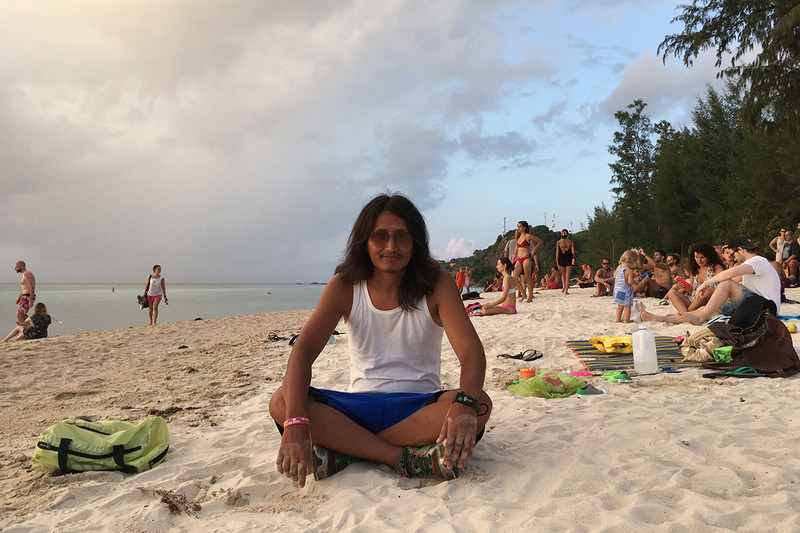 Koh Phangan is similar to Goa — nice beaches, yoga, travellers — and he wanted to try Koh Phangan. He wanted to try yoga (not to be a professional, but just to keep fit), and was also attracted to the conscious community there. So Koh Phangan became a part of the itinerary for his South Asia tour. His plan is to see the whole of Southeast Asia. For leaving Canada, “I looked for the cheapest flight, and it was for Malaysia, so that was my first stop,” he said. After Thailand, his next stop is Burma. That will be the main part of his journey. He will do the Buddhist circuit pilgrimage and learn about past masters there during his two-month stay. He will do several retreats there in the Goenka tradition which he follows, and which originated there in Burma. Then he will go on to Laos, Cambodia, and Vietnam by motorcycle. All together he will have seven months of travelling.